WESTPORT — “Do you think that was the hill?” one of my cycling mates asked as we coasted down the other side of a steep but compact incline. If only we had been so lucky. As it turned out, the remaining days were significantly hillier; the tour, rated as beginner, could qualify as intermediate; and the turn-by-turn cue sheets included several mistakes. But as any touring cyclist will tell you, surprises, like hills, are part of the adventure. Our group gathered on a Saturday evening in mid-June at Myles Standish State Forest, the start of an approximately 300-mile route that would take us through Westport, New Bedford, Martha’s Vineyard, and Cape Cod. We ranged in age from 29 to 72, with most of us over 50 (I’m 54), and hailed from both coasts and the Midwest. Solo travelers and men slightly outnumbered couples and women, and five riders had never tried “self-contained” touring, where participants carry their own gear without the accompaniment of support vehicles. Many Adventure Cycling tours, including this one, involve camping and meal preparation, so on top of personal items, we carried tents, sleeping bags, cooking equipment, and food. “I prefer self-guided touring because you’re independent and it feels like you’re in a rolling family,” said rider Nancy Balch during group introductions. Balch, 55, of Louisville, Colo., has been touring for 30 years, sometimes solo or with friends and other times with Adventure Cycling. 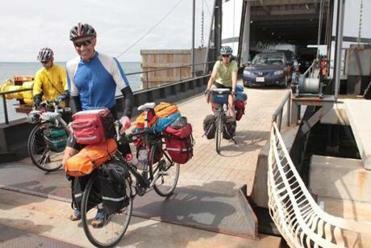 Keeping our traveling family in line was group leader Alice Charkes, 49, an elementary-school French teacher from Brattleboro, who has led several Adventure Cycling tours, including a cross-country ride. While guides with high-end tour operators cater to riders, Adventure Cycling leaders are less concerned with the needs of individuals. We lived out that philosophy the next day, when we all met up at a supermarket in North Dartmouth to divvy up bags of groceries for the remaining 15-mile ride to Horseneck Beach, our home for the night and where Balch and her cooking partner whipped up a tasty couscous and vegetable salad. The following day’s ride took us through rolling coastal farmland followed by Portuguese neighborhoods in New Bedford, mainly on secondary roads we would not have traveled by car. Some of us stopped at the New Bedford Whaling Museum, where Charkes covered our admission from the group’s “play dough,” money set aside for entertainment. Pedaling at our own pace, we continued to loosely hug the coast, finally reaching the luxuriously flat and straight Cape Cod Canal Bikeway. That bit of relaxation was erased by the worst stretch of the trip: walking our bikes over the Sagamore Bridge while automobiles barreled by a few feet away. We camped atop a tortuously steep hill in Shawme-Crowell State Forest, a lovely Sandwich campground marred by Highway 6 traffic sounds, where we feasted on pasta and shrimp. By 9 the next morning, we were tooling along the other side of the canal path, passing great blue herons, cormorants, and fishermen, one with a freshly caught 30-pound striped bass who had as many questions about our hobby as we did about his. Part of the fun of bike touring is interacting with people along the route, a fact not lost on first-timer Gaurav Karnani, 29, of Edison, N.J.
After leaving the canal, we traveled south on mostly quiet roads until reaching the Shining Sea Bike Path from Falmouth to Woods Hole, where we would catch the ferry to the Vineyard. During our morning map meeting, someone mentioned the Woods Hole Science Aquarium (the country’s oldest public aquarium, open since 1885), and I spent my layover there, learning about the region’s marine life. Disembarking at Oak Bluffs, we rode almost completely on bike trails, one with heart-stopping roller-coaster dips, to reach our only indoor lodging, the lovely Hostelling International hostel in West Tisbury. With the use of a full kitchen and a grill, the cooks indulged us with grilled salmon and vegetables. On our free day, and the start of a heat wave, we scattered around the island. 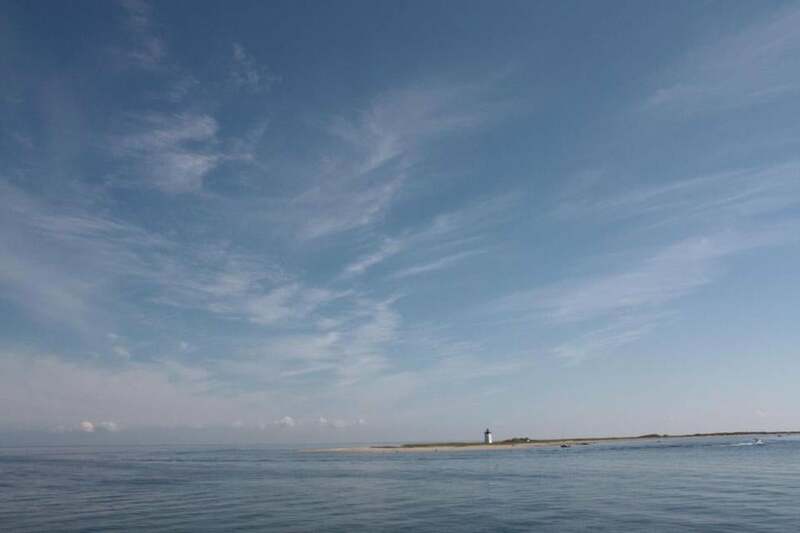 Balch rented a kayak for a few hours, Karnani strolled through Edgartown, two riders visited Orange Peel Bakery and Gay Head Light in Aquinnah, and the rest of us toured Edgartown and took the ferry to Chappaquiddick Island. Our penultimate full day of riding qualified as the toughest, from the Vineyard to Nickerson State Park in Brewster, a 68-mile challenge that included hills, traffic on Route 6A, incomplete directions, and stifling heat. Relief arrived at the start of the Cape Cod Rail Trail, from South Dennis to the campground — where we were then hit with a 3.5-mile killer climb to our campsite. The following day, after a leisurely 10 miles back on the rail trail, we tackled the hilly and thankfully scenic back roads of Wellfleet and Truro. Most of us skipped the suggested side trips to the Great Island Trail and the Cape Cod National Seashore visitors center, though a few of us checked out the stately Eastham Windmill, built in 1680 and only a half-mile off the route. Having traversed the Cape many times before, I was curious whether the newcomers on the trip could see its charms despite the busy roadways and the fact that we bypassed most villages. “There is a lot of traffic, but, yes, I’m really enjoying the architecture, which is so different from back home,” said Kathy Johnson, 62, of Portland, Ore., who was cycling with her husband. In Provincetown, we stayed only a mile from town at Dunes’ Edge Campground. The town delivered its usual set of wonders, from seal spotting at Race Point Beach to people watching on Commercial Street. We gathered one final time on the ferry to Plymouth, landing near the Rock and feeling a bit like pilgrims ourselves after a week of two-wheeled exploration. I later caught up with Adventure Cycling tours director Arlen Hall, who grew up in Northbridge. “I put the tour together because I love this area and I’ve ridden it often,” said Hall, who also has led teen cross-country rides for the Kingston-based Jett Foundation. After we reported our difficulties, Hall realized the route had not been properly scouted. He promised a more polished production next year — but those hills will be staying put.